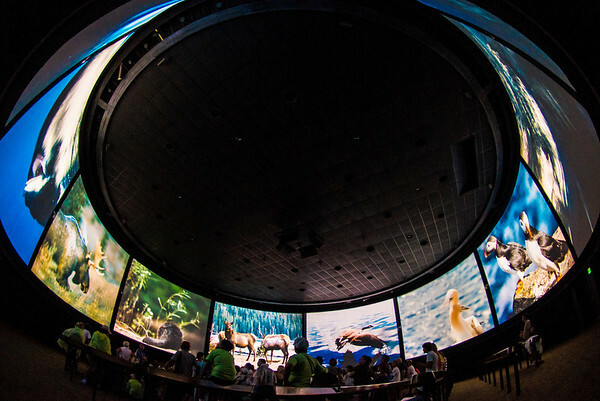 At the Canada Pavilion, which lies in the Southeastern corner of Epcot’s World Showcase as you exit Future World, you can view the CircleVision 360° film presentation, "O Canada!" – a beautifully shot film that takes you on a whirlwind journey throughout the Canadian provinces and territories. While in Canada, don’t miss the opportunity to shop at the Trading Post and Northwest Mercantile (full of authentic Canadian souvenirs) or enjoy a delicious meal at Le Cellier Steakhouse, which features such entrees as steak, prime rib, pork tenderloin and salmon, along with an extensive selection of Canadian wines and beers. The Canada Pavilion also includes Beavertails, a snack bar that serves fresh pastries; Off Kilter, a live band that specializes in Celtic music; La Boutique des Provinces, which sells handcrafted souvenirs; the beautifully landscaped Victoria Gardens; a gushing waterfall; colorful totem poles; and the pavilion’s icon, Hotel du Canada. CircleVision 360° - Exhibición de fotos con 360 grados de visibilidad.